James Bond is back and investigates the mid-air theft of a space shuttle but its never that simple as he also discovers a plot to commit global genocide. As I have gotten further into the Bondathon it has become more difficult and in all honesty didn’t have high hopes for this film (and that was proven to be a wise decision). I think it is a very weak film in all ways to be completely honest. Possibly the worst from Moore? I don’t know why but the space side of it just didn’t get me engaged at all and I felt that it was just that step too far. I am actually really struggling to put this review together as did not feel engaged in the film at all and if I wasn’t determined to watch all of the films I might have just turned it off. I know that is making it sound very bad but it is the poorest I have seen (so far, I’m waiting for Brosnan as heard bad things). So I hope someone can confirm that this one is the poorest of the films? Then at least I can find the power to continue watching? Please!!! I was pleased to see that Jaws was back in this one, although it created a little bit of a problem in the sense that we knew what to expect from the character so didn’t have the edge that made him so great in The Spy Who Loved Me. That didn’t stop a rather impressive fight scene on the cable car, I think that was probably my favourite part of this film. I thought it had a good level of suspense and was exciting to watch it unfold. I just don’t feel like this film had the best one liners either and don’t remember laughing or smiling at many moments from 007. I am hoping that Moore can pick it up again in the next two films I have to watch. I will keep going I promise! 007 will not defeat me. Possibly the worst Bond film ever. Keep going you have the grossly underrated Timothy Dalton movies to come soon. His portrayal is the closest to the character in Flemings novels. They are also ahead of their time, a more gritty Bond 20 years before Craig. Sounds good to me! I have struggled through a couple of them! Oh come on! There’s a pigeon that does a double take on Bond riding through Venice on the hover-gondola! Perfection haha! Yeah Brosnan ain’t all good. GoldenEye is one of the best (my personal fav) but they just get worse and worse and Die Another Day is just horrific. The only film I couldn’t get through in my Bondathon. It doesn’t have any of the appeal of the more stupid (arguably) fun films and is just plain bad. Oh well I still have a while to go before hitting that one . . . It is terrible. In a trainwreck sort of way. I mean, that space laser fight? As awful as it is, you gotta admit you’re glad you saw it, right? I’m usually the first to argue that the best and truest Bond films are the ones that are more grounded, gritty and daring. 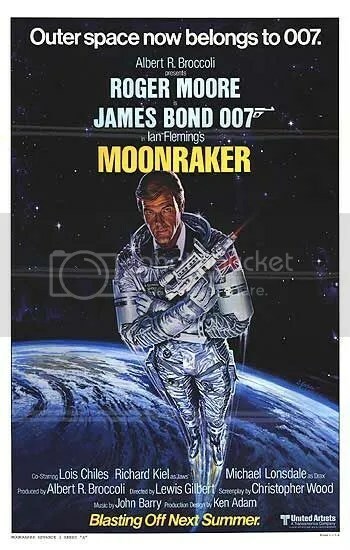 Yet I was always a fan of sci-fi long before I got into Bond so on those grounds I’ve always been willing to admit a soft spot for Moonraker!